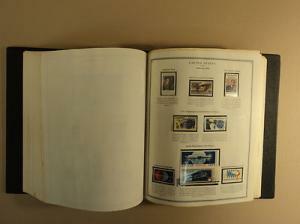 USPS Scott 2429a 25c 1989 Sleigh Full Of Presents 5 Books 100 Stamps 10 Panes. Material: Paper. Color: Multicolor. Made In United States. The contemporary Christmas stamp features an antique toy sleigh, brimming with brightly wrapped presents. 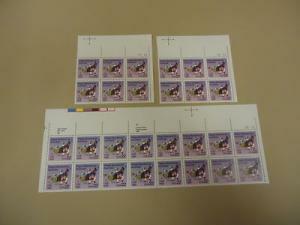 Also issued in both booklet and sheet form, this is the first time a U.S. stamp has been printed by two different institutions. The Bureau of Engraving and Printing produced the booklet stamps pictured here. 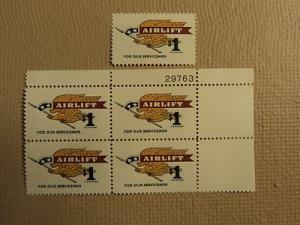 The sheet stamps (#2428) were produced by the American Bank Note Company. 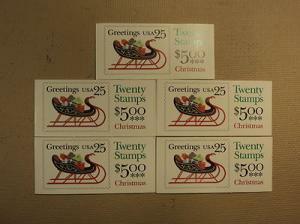 * USPS Scott 2429a 25c 1989 Sleigh Full Of Presents 5 Books 100 Stamps 10 Panes. Material: Paper. Color: Multicolor. Made In United States.